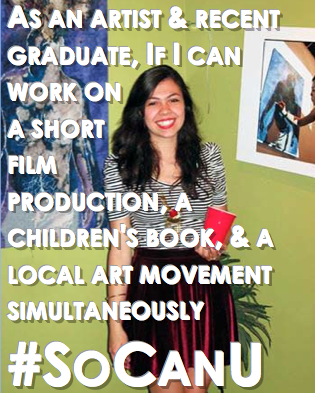 Featured below is an interview with another #SoCanU project rockstar, Angelica! Angelica graduated from Seminole State College of Florida in 2011 and graduated from Stetson University with a bachelor's degree in art. She currently is an artist at Gallery on First, an illustrator for a children's book, and an assistant art director for a short film. It may sound negative, but I chose community college out of ignorance. I had absolutely no knowledge of how to apply to a big college nor did I think I could get in. I also I didn't think I could afford any other institution. It provided comfort and familiarity since my brother and everyone in my close social circle chose community college. I was very self-concious and ashamed to smile because I had crooked teeth, I was very shy and insecure because of this, which affected my confidence a lot. It was my junior year in high school that I decided to stop feeling bad about my self and got a job at Haggen-Dazs so I could pay for braces. With my Dad's help, I made an appointment at an orthodontist and after a lot of discomfort and awkward drooling, two years later I got my braces out and payed off my debt. Through this experience my confidence skyrocketed not only because I was able to smile with no boundaries but also because I had done it myself, I payed for it myself. I consider it my first victory where I took full responsibility of something that made me feel insecure. This is the approach I take on whatever problem/obstacle I have now, instead of feeling sorry for myself, I try my best to take initiative and reach out to resources. I was never the type of girl that got involved, (I was a hermit in high school) but once I became friends with people who were at Seminole State College, I realized the importance of taking a leadership role and learning to advocate for things I was passionate about, like my heritage. I felt part of something bigger and with purpose, It made my experience so much richer. I became friends with people I would usually not talk to. As far as my experience at my university, I felt very much out of place. Most of the time I was alone...However, part of that experience helped me put all my time and effort into my senior thesis, where I excelled at and was very proud to show. Getting involved in the Hispanic Student Association, and Seminole State Volunteers. It was through these organizations that I broke out of my comfort zone and had the chance to attend leadership retreats that helped me learn my strengths and weaknesses. I understood the impact of my involvement in the community as well as my role as a leader for my peers. I would also say that the quality of mentors pushed me to embrace my strengths and believe I could become an artist. The professors I had also made a huge impact, since the art program was so small the professors provided close attention to our progress and gave all their support. Grad school and traveling, now that I have gotten some exposure locally and I have experienced artistic success I feel very confident and motivated to continue my pursuits in a higher institution. 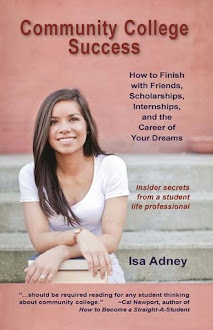 My goal is to study abroad and hopefully receive my master's in London, Chicago, or New York. I am ready to explore my horizons. To look past the stereotypes of a community college and to fully take advantage of the resources and opportunities that are offered; like joining clubs, leading clubs, creating relationships with professors and staff. Being fully involved academically and socially is what gets you scholarships and sets you apart from students who limit their experience to be solely academic. I know it can be a challenge specially if you have a job but it is possible. Once you start applying to other colleges and universities they look at what you have done and how you have performed in previous institutions, so it's only to your advantage to take advantage. It's full circle.